Yes, I was shocked too. But such an opinion is not that far removed from what many Yeshua-believers/Jesus believers think about the L-word, Law. Law is icky while grace is great. Or so the story goes. Now we come to another dangerous word: the S-word, something from which people veer away: And here I mean the word “slave,” which in Hebrew is עבד. I want to speak specifically being a slave of God. I am convinced that it is only by understanding, embracing, and living out the implications of this term, that we may live the life and find the freedom God desires for us and we should desire for ourselves. The meanings of words are determined not by lexicons or dictionaries, but by how they are used. I teach Bible study methods under the Interfaithfulness Jewish Advantage Initiative. I teach the principle that we can best avoid erroneous and fanciful interpretations of the meaning of words and texts if we will stay as close as possible to the immediate context of the word or passage. FOr example, in examining the meaning of the word עבד in a passage in Leviticus, the best place to determine its meaning is in how it is used first in the verse in question, then the surrounding material in that book. In the case of עבד. our job is made easier because it is used only eight times in Leviticus, in chapter 25 and 26. So let’s see how עבד is used in Leviticus, and from there derive some conclusions about its meaning. The word we are especially interested in is pronounced eved and its plural is avadim. And if your brother becomes poor beside you, and sells himself to you, you shall not make him serve as a slave (eved) : he shall be with you as a hired servant (sachir) and as a sojourner (toshav). He shall serve with you until the year of the jubilee; then he shall go out from you, he and his children with him, and go back to his own family, and return to the possession of his fathers. For they are my servants (avadim), whom I brought forth out of the land of Egypt; they shall not be sold as slaves (of somebody else – avadim). You shall not rule over him with harshness, but shall fear your God. As for your male and female slaves whom you may have: you may buy male and female slaves (avadim) from among the nations that are round about you. You may also buy from among the strangers who sojourn (gerim ha-toshavim) with you and their families that are with you, who have been born in your land; and they may be your property. You may bequeath them to your sons after you, to inherit as a possession for ever; you may make slaves of them, but over your brethren the people of Israel you shall not rule, one over another, with harshness. Let’s lay aside any outrage we may have about the institution of slavery. The slavery mentioned here is not like the slavery of the American pre-Civil War South. For example, we read in Exodus 21 something that was not true of practice in the American South: “When a man strikes the eye of his slave, male or female, and destroys it, he shall let the slave go free because of his eye.” This was a different cultural milieu where subject people were routinely killed as a matter of state policy. Slavery became a means whereby such persons could be permitted to live, although denied certain freedoms. Again, let’s lay aside of the moment our outrage about slavery, which may be overblown or misplaced in this context, even perhaps not. Imbedded in the passage just quoted are gradations of ancient Israel’s society structure. We do not have time to deal here with nuanced definitions. But these gradations are not the focus of today’s considerations. The point I wish bring into focus for us to here is what Leviticus means when it uses the word eved or its plural avadim. Slaves were owned, they were property, unlike servants who served for a discrete time and then were by policy set free. And slaves were rule over, sometimes with harshness. Again, they were property, so much so that they could be willed from one generation to the next. is the bottom line God draws concerning the children of Israel. Notice verses 42 and 43, in context.`For they are My servants whom I brought out from the land of Egypt; they are not to be sold in a slave sale. You shall not rule over him with severity, but are to revere your God. The sons and daughters of Israel were not to be sold as slaves because they were already the slaves of Another, slaves to Hashem who brought them out of the Land of Egypt. Even if he is not redeemed by these means, he shall still go out in the year of jubilee, he and his sons with him. 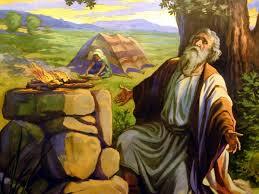 55 For the sons of Israel are My servants; they are My servants whom I brought out from the land of Egypt. I am the LORD your God. You shall not make for yourselves idols, nor shall you set up for yourselves an image or a sacred pillar, nor shall you place a figured stone in your land to bow down to it; for I am the LORD your God. `You shall keep My sabbaths and reverence My sanctuary; I am the LORD. We will explore the implications of this last passage at greater length later in this document. For now, it important to remember that all of these passages deal with what it means to be slaves of God–totally owned and totally accountable. This concept goes right to the core of everything we are and everything we do. Yes, it is more than a concept. Concepts are ideas that come and go—something we pull out of our tool chest when we need them, or put away for a time. This is not an idea issue—it is an identity issue. What the Torah is challenging me about, and challenging you about, is this: who are you, really? And what God is telling all of the children of Israel is this: “I bought you, you are mine, and no one else’s. We are owned by the One who bought us with a price. Therefore we are not free to simply do as we choose, nor are we to allow others to do with us simply as they choose. Leviticus examines the meaning of what it means to be slaves/servants of God in three key aspects: (1) identity; (2) Time and energy; (3) values and priorities. The idea that the people of Israel have been endowed with a capacity for instructing and girding all of humanity has no basis in authentic Jewish sources…. This idea was fabricated by the heretics – from the Apostle Paul to Ben Gurion – who meant to cast off the yoke of the Torah by substituting for it a faith in an abstract ‘vocation.’ The Jewish people were not given a mission, they were rather charged with a task – the task of being servants [actually, slaves] of God. Yeshayahu Leibowitz, Judaism, Human Values, and the Jewish State, translated by Eliezer Goldman (Cambridge: Harvard University Press, 1991), 108. R’ Joseph B. Soloveitchik z”l (1903-1993) observes that there are two ways to express servitude. One is reflected in the language of the Pesach Haggadah: “We were slaves to Pharaoh.” The second is reflected, for example, in the verse (Bereishit 24:34), “I am Avraham’s slave” (i.e., the possessive form). What is the difference between these? R’ Soloveitchik explains: The first expression reflects a purely legal relationship: “I am my own person, and I happen to be a slave to Pharaoh at present.” In contrast, the second expression means that my very essence is bound up with my master. Based on R’ Soloveitchik’s explanation, it is possible to explain our verse as follows: Bnei Yisrael’s relationship with Hashem begins as a formal legal relationship of Master and servant – “Bnei Yisrael are servants to Me.” However, the relationship goes much deeper. “They are My servants” – their essence is bound up with Me. In other words, being my servants is not simply what they do—it is who they are. [In our terms, they are God’s slaves–bought with a price]. And this is the identity issue I am placing before us in this blog post: Who are you really? Who am I really? If we settle this issue, every decision of life is clarified, and many of our conflicts and struggles will lose much of their strength, because our conflicts are born of indecision—inner strife between conflicting senses of who we are , what we want for ourselves, and what are our rights and responsibilities. . Once we accept that we are God’s slaves, all else flows from that, and life is simplified but more focused and powerful. In the sixth chapter of Baba Metzia we learn the halacha that “a worker can withdraw from his employment even in the middle of the day” (Baba Metzia 77a). The Gemara restricts this halacha to a worker and not a contractor. The distinction between a worker and a contractor is that a worker is paid for his time while the contractor is paid for the job. If a person was hired to plow someone’s field at the rate of one hundred shekels per day, then should he quit in the middle of the day he would be able to demand fifty shekels for his time. Obviously one should not do this unless there are other workers available to finish the work. If, however, he was hired as a contractor – this means they agreed upon a sum for example of one hundred shekels to plow the entire field no matter how long it takes he would not be permitted to quit in the middle of the day. If the contractor does so he would have no right to demand remuneration for work already done. Why do we find this distinction: that a worker is permitted to withdraw from his employment in the middle of the day while a contractor may not? The answer is found in the Torah’s affirmation “for the children of Israel are [slaves] to Me, they are My servants” (Vayikra 25:55), from which the Gemara deduces that the Jewish people are “not servants of servants” (Kiddushin 22b). The Torah does not want us to sell our time, for time is consecrated for serving Hashem – we are servants of Hashem and not of other servants. A person who sells himself to work the entire day leaving him no other option has in effect sold himself into slavery, albeit for only one day, but still he becomes a subject of his employer. To prevent a person’s time from becoming completely subjugated to another person, the Torah permits a person paid for his time to withdraw from his employment in the middle of the job. A contractor, on the other hand, sells his work. . . . The Torah encourages selling one’s work while it does not encourage selling a person’s time. (Found http://www.yna.edu/torah/wx-display.php id=1362446805&fn=p_ne66vshv.html&search=&print=yes). The point is that our time fundamentally belongs to God. We are his slaves, and are not to allow ourselves to be enslaved by others, even in dribs and drabs . We should not enter into arrangements and relationships where we barter away our availability to God. As his slaves we should strive to maintain our availability to him. Our Torah reading makes this point explicit in terms of shabbat-keeping. The keeping of shabbat is a huge test-case of this core identity issue: Who am I really? If I am really God’s slaves, then my time is not my own. The shabbat belongs to God and not to me. My time does not fundamentally belong to my employer either: God owns me in all ways and at all times. We used to have a guy in my synagogue who worked for Disney corporation. Disney has a reputation of driving a hard bargain with the talent it employs. But this fellow had written into his contract that two hours before sundown on any Friday he would be gone! He made that contract because shabbat does not belong to Disney, no matter how much they pay and no matter how secularized their worldview. Shabbat belongs to God. And if you work for someone who will not accept that what should you do? If you are really a slave of God, there is really only one answer. If being a servant of God is simply what you do, a hat you wear, that’s one thing. But the question isn’t a matter of what hat you are wearing: it is this–Who is the person under the hat? Or perhaps, whose is the person under the hat? And the person under the hat is a slave of God–you. If we will remember to understand ourselves in this way, we will know that in every area of life, we are to be at his disposal first and foremost. We are bought and owned. We must learn to see our core identity as being that we and our time and energy belong entirely to God. At that point, every decision becomes clearer—life gets less confusing. We have looked at this relationship in terms of identity and in terms of time, Let’s look at it now in terms of priorities and values. The end of our Torah reading says this. These idols were not simply chatchkies—bric a brac that people took into their homes. An idol was a focus of devotion—it represented a reordering of priorities. For example, if you are a practitioner of Nicheren Shoshu Buddhism, a growing group with headquarters in Santa Monica, you have in your home a butsudan, a box, an altar, where various objects, a water cup, an incense tray, candles, evergreens, offerings such as rice or fruit would be placed as offerings. Inside the box is a gohonzon, which means “object of devotion,” a scroll on which is written a phrase which is chanted over and over again to activate the Buddha-nature of practitioners. On the scroll are also the names of various deities which protect that Buddha nature. Practitioners of this kind of Buddhism routinely spend hours chanting in front of the butsudan and are told to expect that their wishes and those of their families will be fulfilled, happiness assured, and sufferings ameliorated. The reason we are not to do such things is simple: our life is not to be about self-realization, nor about serving other deities with whom we enter into a relationship of devotion so that we can get what we want with their help. That is idolatry empowered by beings other than the true God. It is also very self-centered. We are not to do this because Hashem alone is to be our source of values, of empowerment—our reference point and origin of life, breath, everything. But whenever we turn to other things as our focus for empowerment and fundamental orientation, these others things become idols. The ultimate answer to the question of who it is under the hat is this: I am Hashem’s slave, accountable and available to him, from whom alone comes my orientation and hope for success, well-being, happiness, and deliverance from suffering. Antigonos of Sokho received the tradition from Shimon HaTzaddik. Do not be like servants who serve their master expecting to receive a reward; be rather like students who serve their master unconditionally with no thought of a reward. Also, let the reverence of God determine your actions. This is the attitude we should have. We serve God and do his will not because of what we will get out of it but because of who he is and of who we are. The idea that the people of Israel have been endowed with a capacity for instructing and girding all of humanity has no basis in authentic Jewish sources…. This would involve casting off the yoke of the Torah by substituting for it a faith in an abstract ‘vocation.’ The Jewish people were not given a mission, they were rather charged with a task – the task of being servants [rather, slaves] of God. We are not simply charged with the task of being slaves of God. We are charged to remember that we are slaves of God. This is who we are. And we do what we do, and do not do what we don’t do, for that reason. Or don’t you know that your body is a temple for the Ruach HaKodesh who lives inside you, whom you received from God? The fact is, you don’t belong to yourselves; for you were bought at a price. So use your bodies to glorify God. I find that adopting this perspective, which I have just begun to employ after more than half a century as a Yeshua-believer, create great freedom. I can ignore the disapproval or withheld approval of others. Their comments and looks are a bit out of focus now, because my focus in is one direction. What does God want and therefore what should I be doing? That needs to be our bottom line, don’t you agree? We are bought with a price . . . to be God’s slaves. Let’s get on with it. thank you Rabbi much to consider here. recently I heard in a sermon that followers of Yeshua are to be counter cultural. I think living in God as a slave of God in this time and culture is just that. living this way consciously from moment to moment is what slavery to God means to me. yeshua could say that he heard his father and obeyed his voice and did his works because he was a perfect slave. how that works out in daily life is something I strive for and struggle with.